Hoarder Rescue is a hoarder cleanup service. Clutter cleanup can be overwhelming. It takes the right experience, knowledge, and resources. At Hoarder Rescue, we have the necessary skill-set to ensure the job is done properly the first time. In addition to being thorough, our service is also discreet. Our mission is to provide the best cleaning service along with the best customer service. Hoarder Rescue is located in the Tampa, Florida area. We service clients across the entire state of Florida. We accommodate hoarder cleaning jobs in Florida of all sizes. We stand by the notion that “No Job Is Too Big Or Too Small”. There are a number of misconceptions in regards to hoarding. The same is true when it comes to cleaning. Hoarders often display a number of similar traits. The process of efficiently removing the clutter is not one size fits all. Although individuals express similar traits, no two people are alike. Just as no two clutter clean up jobs are the same. We offer a variety of clutter cleanup services. 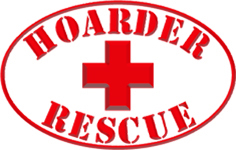 The Hoarder Rescue Team will work at your pace, with your budget and according to your specific needs. We will personalize a plan of remediation perfect for your situation. Our team is trained to make no judgements or opinions of your situation. We always provide unmarked vehicles and unmarked team uniforms for your privacy. We perform extensive searches for valuables, personal items, sentimental items, photos, important paperwork, etc. Dumpsters are delivered on-site for trash removal such as furniture, house hold items, visible trash, carpet, etc. Trailer service is also provided for smaller jobs. The Hoarder Rescue Team offers photo documentation for all services provided and an extensive list of referral contractors that you may need. Contact Hoarder Rescue, we provide free Florida hoarder cleaning service estimates.